The seat of Germany’s parliament right in the centre of its capital city, Berlin. It’s also a building with a very chequered history, which is the reason it’s featured here as a dark tourism sight at all. As such it is perhaps only mildly dark, as very little of its dark history legacy is actually visible today. In the main, the building is a tourist magnet for very different reasons: in particular its spectacular glass dome that visitors can climb via two spiralling walkways inside the dome itself. Below the dome is the plenary hall of the German parliament, the Bundestag. So in a way tourists are “on top of” the politicians when they visit the glass dome … This rather cheerful approach of implying openness, and its immense popularity (the Reichstag is the most visited parliamentary building in the world), almost obscure the dark sides of its past – notably in connection with the Nazi era, but also during the years of the Cold War division of Berlin. On the night of 27-28 February – only four weeks after Hitler had become Reich’s Chancellor – a fire destroyed much of the interior of the Reichstag. It was quickly presumed to have been arson – but who was to blame remains controversial to this day. The Nazis convicted a Dutch communist for the crime (and in predictable Nazi style executed him). Some claim it may well have been the Nazis themselves who set the building on fire. Why? Because they certainly seized upon the opportunity to use the case as a pretext for pushing through drastic measures, including a wide-ranging suspension of civil liberties. In that way the Reichstag fire has become symbolic as the starting gun for the full reign of terror that the Nazis then unleashed. The Reichstag, bombed during the WWII but left largely standing, again became a historic symbol when the Red Army conquered Berlin at the end of War – the photograph of the Soviet soldiers hoisting the red flag on top of the damaged Reichstag building is one of the most iconic of the whole period ... though it was actually the result of a re-enactment staged specifically for the photograph some time after the real event had taken place during the battle for Berlin. During the years of Berlin’s division in the Cold War era, the Reichstag again became one of the symbols of the East-West conflict, located as it was right next to the Berlin Wall just a stone’s throw from the Brandenburg Gate on the other side of the Wall. Not long after the reunification of Germany, parliament debated its relocation to Berlin, now declared the capital city of the whole country. A narrow majority decided in favour of the move to Berlin and planning work began on making the Reichstag once again the seat of the German parliament. Before the building was reshaped for that purpose it was used on the grandest artistic scale when the artist Christo was allowed to “wrap” the building. Coming to see it completely clad in silver sheets became a massive tourist draw in the summer of 1995. Immediately after the building had been “unwrapped” again, the rebuilding work on the Reichstag began. In 1999 the parliament moved in. 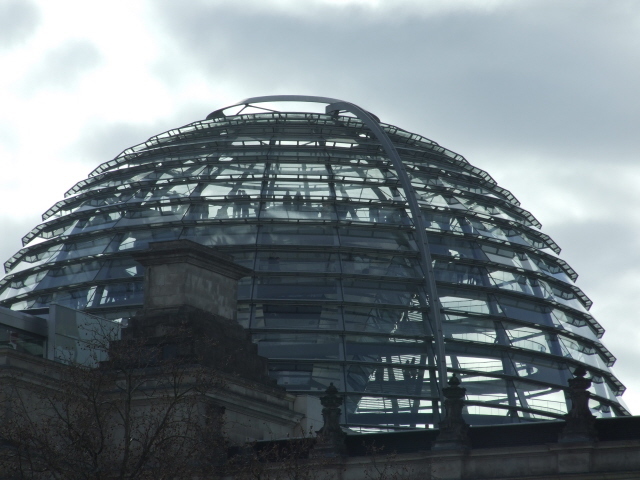 Today the Reichstag with its glass dome is one of Berlin’s prime tourist attractions. What there is to see: Mainly the glass dome of the building itself. From up there you get a good view of Berlin – and a glimpse of the inside of the parliament below the dome too. Visible traces of the building’s previous history are some Russian graffiti left behind by Soviet soldiers at the end of WWII in 1945. These were (re)discovered in the course of the building work begun in 1995, and have been preserved as a historical memento. Access and costs: easy to get to but restrictions due to security apply; free. Details: To get to the outside of the Reichstag building couldn't be much easier – it now even has its own metro stop ("Bundestag"), namely on the new short line U55 that connects the main station ("Hauptbahnhof") with "Brandenburger Tor". The latter (formerly called "Unter den Linden" and once a ghost station) is served by the convenient lines S1 and S2. Or take the bus: line 100 gets you straight to the door as well … or rather: to the queue outside the door. Given that it’s the seat of the nation’s parliament, security is predictably very tight, nothing short of what you have to expect at international airports these days. That doesn’t deter massive numbers of visitors, though, so the queue outside can get very long indeed (you can see it on google maps!) and it moves quite slowly because visitors are only admitted in batches (of 25 at any one time). On the plus side: admission’s free. Opening times: the glass dome is open from early in the morning (8 a.m.) to late in the evening (midnight, but last admission is at 10 p.m.), daily. Coming early or late can pay off, but there’s no guarantee that you’ll be able to avoid queuing, such is the popularity of the place. Time required: How much time visitors want to spend on the roof/inside the glass dome will vary a lot. A minimum of half an hour should be allocated – that’s for net visiting time, walking up the spiral walkways, looking around, taking in the extraordinary atmosphere, and leaving the building again. You may want to stay longer, e.g. to exploit the unusual photographic opportunities, or to relax in the roof-top café. However, be prepared to be forced to add significant waiting time before you can even get in. This can take longer that the actual visit. Guided tours of the building (which have to be pre-booked – see above) last 90 minutes. Combinability with other dark destinations: generally see Berlin – closest to the Reichstag, remains of the Berlin Wall can be found just around the corner, though not the very best examples: there are some memorials including segments of the original Berlin Wall, in one of the nearby modern government buildings, and as part of the so-called Parliament of Trees peace memorial; furthermore there’s the monument to those who lost their lives trying to cross the GDR border, right by the Spree river behind the Reichstag. To the south-west of the building is one of the Soviet War Memorials, on the Straße des 17. Juni, just a short walk westwards up the street from the Brandenburg Gate. A short walk south on Ebertstraße is the Holocaust Memorial. Ebertstraße also takes you to Potsdamer Platz, where you can pick up more of the Berlin Wall trail, with the nearby Berlin Wall watchtower, further Wall remains along Niederkirchnerstraße, bordering the Topography of Terror exhibition, and Checkpoint Charlie. 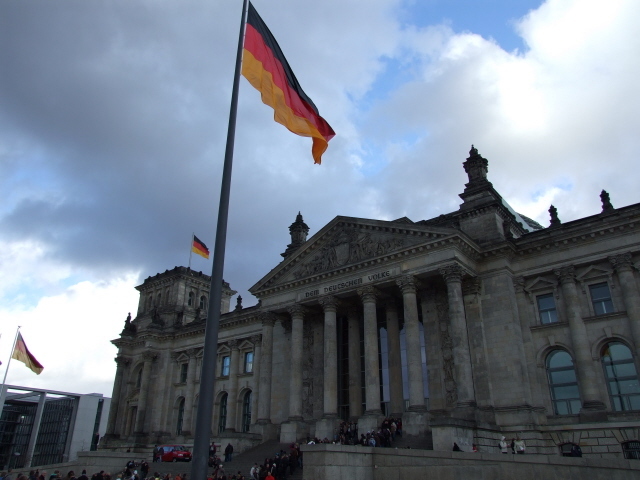 Combinability with non-dark destinations: generally see Berlin – the Reichstag is in itself primarily a non-dark tourist sight, and others are close by: in particular the Brandenburg Gate, just behind the Reichstag, and all the modern architecture buildings of the government quarter. 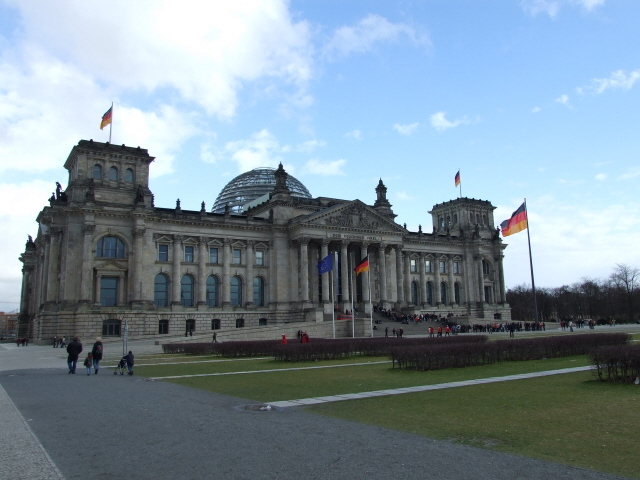 West of the Reichstag stretches the vast green expanse of the Tiergarten Park, and east of the Brandenburg Gate extends the main boulevard of the central district of Mitte, leading all the way to the Museum Island and the Cathedral, all conveniently connected by bus line 100.